The CDH Hotel Radda is located in the beautiful Medieval village Radda in Chianti. It is dipped in the most famous Tuscan wine destination and surrounded by the gentle hills of Siena. CDH Hotel Radda features the typical elements of the modern Tuscan style with a stone façade, cotto and serena stone floors. The property is spread over three floors that house the rooms, the restaurant and the spa. In the garden there is a swimming pool with hills view and s solarium area. The 60 rooms of the CDH Hotel Radda are comfortable, quiet and bright. All room typologies presents precious details, are equipped with every comforts and can have a hills or courtyard view. Classic French - 16 sqm, for single use with queen-size bed and en-suite bathroom with shower. “My Wellness” is the Spa of the CDH Hotel Radda where guest can relax and regenerate themselves thanks to the whirlpool bath indoor, sauna, Turkish baths and a large selection of beauty treatments. Located in the ground floor, the menu of the De Gustibus Restaurant is typical of the Tuscan region with a unique chef's touch. All dishes are accompanied by a local wines list that can also taste at the Wine Bar with a buffet aperitivo. It is possible reserved a cozy and intimate area of the restaurant for 10 people and a table in the terrace for romantic dinners. The breakfast is usually served in a dedicated room in the first floor while in the summer guest are welcome in the courtyard. On request: countryside excursions, wine tasting at local wineries, vespa and bicycle tours. A multilingual staff will be at guest disposal for additional services and information. The tourist tax is Euro 2,50 per person per day, to be paid on spot. Comfortable, quiet and bright spread throughout three floors. They are characterized by a Tuscan modern Style and equipped with cotto floor and several facilities. The en-suite bathroom provides a tub and some have a shower. 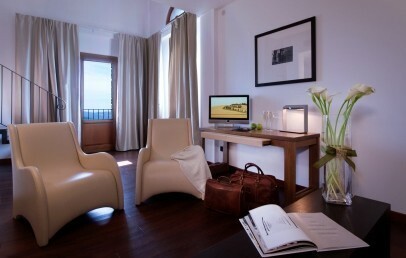 The Classic rooms can have view on the courtyard or on the hills of the Chianti. Comfortable double room with queen-size bed for single use, distributed throughout the three floors of the hotel. They are characterized by a Tuscan modern Style and equipped with "cotto" floor and several facilities. The en-suite bathroom provides a bathtub and some have a shower (on request). The Classic French rooms enjoy a view on the courtyard or on the hills of the Chianti. Comfortable, quiet and bright spread throughout the three floors of the hotel. They are characterized by a Tuscan modern Style and equipped with "cotto" floor and several facilities. The en-suite bathroom provides a shower and some have a bathtub (on request). The Deluxe rooms have either a courtyard view or view on the hills of the Chianti.